FEATURES Half silk and half wool, both silky and elegant, and soft and warm wool. 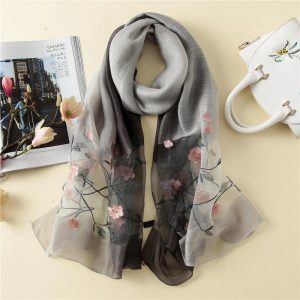 The translucent gradient adds a touch of scent to the scarf. The exquisite embroidery process combines the floral pattern with the silk fabric perfectly, elegant and dignified. Pure natural plant dyed, the color is natural and shiny. Advanced dyeing process, more solid color, not easy to fade. Purely artificially modulating the dye, the color is more pure, more in line with the modern aesthetic. 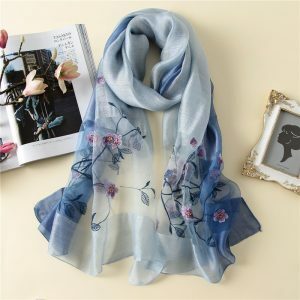 The silk fabric is breathable and moisture-absorbing, and the wool fabric is soft and skin-friendly. 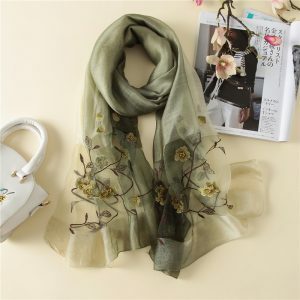 The combination of the two makes the scarf more comfortable to wear, both aesthetic and warm.